Seventeen previously unknown species of reptiles and amphibians recently identified from the threatened rainforests of eastern Tanzania hit the news on Monday. The species are mainly herptiles such as chameleons, tree frogs and snakes. 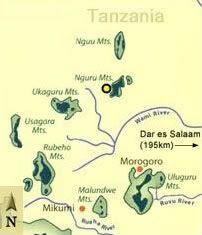 highlights the rich biodiversity of the East African country’s South Nguru Mountains. You can read more and see photos in the journal Acta Herpetologica. The region’s ecosystem has been under threat from fire, logging, collection of wood for fuel and land clearance for cultivation. To mitigate damage, the government and villagers have outlined a series of steps needed to improve conservation. Such steps include reducing the population’s dependence on unsustainable methods of growing cardamoms, a popular cooking spice and an important cash crop for highland farmers. Authors of the work include Michele Menegon of the Natural Science Museum of Trento in Italy and Tanzanian colleagues produced the paper. Conservation in any country remains a complex issue because working with other countries and the many agencies complicates matters. New discoveries are always a delight. You can find the new species in the news here.